Towards the suture’s two ends it will ooze. I was born with this semi-rare condition in the mid-1970s. I was the first-ever case encountered at the hospital in which I was born, and when I began treatment at a large medical teaching hospital, I was only the second or third case they had ever seen. An infant’s skull is made up of free-floating bones separated by sutures: the vertical metopic and sagittal sutures and the horizontal coronal and lambdoid sutures. This arrangement allows the head to pass through the birth canal, and as the brain grows, open sutures allow the skull to expand and develop into its normal shape. 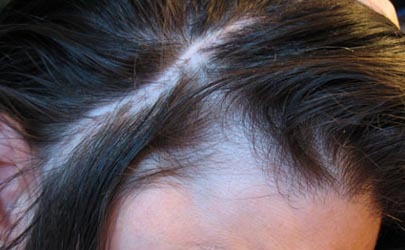 Craniosynostosis (CS) is the premature fusion of one or more of these sutures. 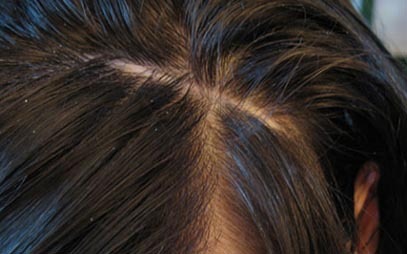 Closed sutures cause the brain to grow and the skull to expand in the direction of sutures that are still open. This results in an abnormal head shape and facial deformities, and can also cause increased intracranial pressure when the growing brain presses against an unyielding skull. If untreated, this increased pressure can cause seizures, chronic headaches, developmental delays, and gradual visual failure. In severe cases it may also be fatal. In addition, facial deformities that affect the middle of the face may cause upper airway obstructions. 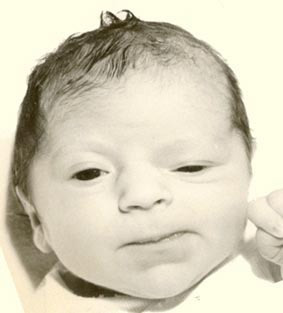 This was taken right after I was born. My uneven eyes and strangely-shaped head (the latter of which is not really visible in this photo) were two tip-offs to my doctor that something wasn’t right. 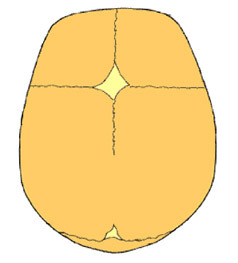 Sagittal synostosis (scaphocephaly) is the premature fusion of the suture at the top of the head. It forces the head to grow long and narrow, rather than wide. The most common type of CS, scaphocephaly, is three times more common in boys and its incidence is approximately 1 in 4200 births. 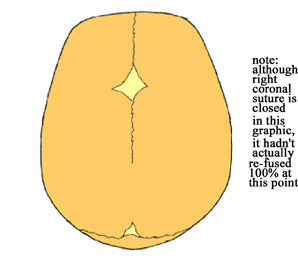 Coronal synostosis (anterior plagiocephaly) is the premature fusion of one of the sutures that run from each ear to the sagittal suture on top of the head. It may force the forehead to flatten on the affected side, raise the eye socket, and cause a deviated nose and slanted skull. This second most common type of CS is more common in girls. Untreated, it may lead to vision loss on the affected side. Bicoronal synostosis (brachycephaly) is where both coronal sutures fuse prematurely, creating a flat, elevated forehead and brow. 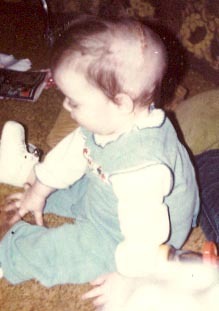 Metopic synostosis (trigonocephaly) is the premature fusion of the suture that runs from the nose to the sagittal suture. 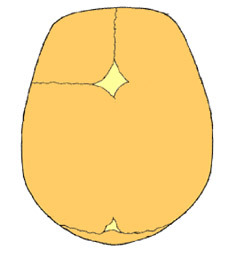 It gives the skull a triangular appearance. Lambdoid synostosis (posterior plagiocephaly) is the rarest form of CS and involves the suture that runs across the skull near the back of the head. It may cause flattening of the head on the affected side. 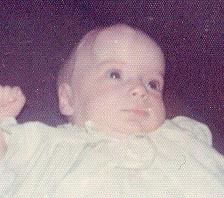 This somewhat grainy shot of the large lump in my forehead was taken when I was two months old, after my first surgery. You can also sort of see one of my incisions and my shaved head. the most common is bilateral coronal synostosis. Oxycephaly (also known as turricephaly and high-head syndrome) is a conical-shaped head and is a variation of the complex, multiple-suture, nonsyndromic form of CS; it usually results from a combination of bilateral coronal, sagittal, and sometimes lambdoid synostosis. Cloverleaf skull deformity is a separate entity characterized by a typical head shape due to bilateral constrictions at the sylvian fissure (which divides the frontal lobe and parietal lobe above from the temporal lobe below). Complex multiple-suture synostosis, often referred to as pansynostosis, includes various deformities involving multiple sutures in patterns not conforming to any of the other types. The overall incidence of CS is estimated as 1 case in 2,000 live births. Crouzon syndrome has an incidence of 1 case in 60,000 live births, Apert syndrome has an incidence of 1 case in 10,000 live births, and Saethre-Chotzen and Pfeiffer syndromes are much less common. Approximately 63% of all cases occur in males. Autosomal dominant inheritance has been clearly identified in syndromic forms of craniosynostosis, although a number of patients have spontaneous new mutations. No inheritance pattern has been identified for nonsyndromic forms of craniosynostosis, although a familial occurrence has been observed in 4-10% of the patients. Additional stenosis of the uncraniectomized portions of the sagittal suture had caused my head to elongate in a “dolicocephalic fashion” and there was a prominent suture palpable in the sagittal region of the head. These refusing sutures necessitated a second surgery (a strip craniectomy) which took place when I was six months old. In this surgery, the craniectomy was extended along the sagittal suture to the low parietal area to the region of the ears bilaterally. The strip craniectomy was performed in the midline sagittal suture and then in the coronal plane to either side. All my sutures stayed open afterward. These shots of my shaved head and one of my incisions were taken when I was eight months old, one month after my second surgery. The surgeries were a bit primitive by today’s standards, but nonetheless, they saved my life. As my doctors were quick to point out, I probably would have ended up developmentally delayed at best or dead at worst if the condition hadn’t been repaired. After my first surgery, they noted that my brain was pulsing at a much healthier rate post-op than pre-op. This means that brain movement had been sluggish beforehand, due to the resistance it was facing as it grew against my unyielding skull. Also, between the two surgeries, the surgeons discovered that my brain was bulging and pushing through my sagittal sinus. This was because my poor little brain had nowhere else to go as it grew. In view of these two surgical observations, I see the merit in my doctors’ fears that the CS, if left untreated, would have lead to brain damage and/or death. During one of the surgeries, when a piece of my skull was being cut, the dura mater covering my brain was accidentally lacerated. This was repaired and (presumably) it left no residual damage. My skull remains quite lumpy, dented, and scarred (phrenologists would wet their knickers if they felt my head! ), but thankfully my hair is thick and covers all the damage, aside from the dent in my forehead which is visible because I refuse to wear bangs. At age 4 1/2 doctors reported that my skull was still somewhat dolicocephalic and asymmetrical. In this shot I was almost five years old and undergoing occlusion therapy for exotropia (hence the eyepatch over my dominant eye). Either the CS or its surgeries caused me to develop exotropia in both eyes—both turned outward. I had to unconsciously choose one eye that could be forced to look forward more often than not, and for whatever reason, my left eye assumed that role. Basically, I became extremely left-eye dominant and my right eye weakened considerably. Although the exotropia was corrected with surgery when I was nine years old, I remained excessively left-eye dominant. This means that I am cross dominant—I’m right-hand dominant, right-ear dominant, and right-foot dominant, but left-eye dominant. The exotropia was not terribly uncommon; CS syndromes can be associated with missing extraocular muscles or muscles with abnormal insertions, and dissociated eye movements have been observed in a large proportion of patients with a variety of craniosynostosis syndromes. Aside from exotropia, CS patients often show eye movements in which a horizontal movement by one eye is accompanied by upshoot or downshoot in the other eye. The CS also screwed with my teeth, to the point where I had to begin years of rigorous orthodontic work—braces (twice! ), rubber bands, headgear, and a retainer—earlier than most of my peers (when I was in 4th grade). I finally stopped wearing the retainer when I graduated from college, which was a mistake, because my teeth promptly began shifting again. This didn’t happen to any of my friends who previously wore braces, so I’m assuming that it, too, is tied in with the CS and the skull deformities left in its wake. My right temporalis muscle was damaged from either the CS or its surgeries, and photographic evidence suggests that it may have begun detaching from my skull at an early age, although nobody (myself included!) noticed it. It finally detached itself completely from my skull in early adulthood; I had surgery to reattach it when I was 23. This was taken a few days after the 1997 surgery to repair my temporalis muscle and put an implant in my forehead. The incision went right over one of the incision scars left by my childhood surgeries. Although facial swelling isn’t evident in this photo, you can see some of the yellow bruising along my temple and around my eye. My doctor wrapped the edge of the muscle in a sheet of Gore-Tex, attached the muscle to the sheet with Gore-Tex stitches, and reattached the whole thing to my skull with more Gore-Tex stitches (my skull was too thin and deformed to support metal screws). At the same time, he ingeniously carved a 4-mm implant out of Gore-Tex (since my insurance company wouldn’t pay for a hard implant) and used that to fill the large dent that had been in my forehead ever since my CS surgeries. Unfortunately, the implant gradually got compressed by scar tissue, making it smaller than the dent it was meant to fill. Although my dent looks better than it did before the surgery, it’s not completely filled, and the outline of the implant is somewhat visible in the dent. Years later, my scars usually stay nicely hidden by my hair, although they can be visible when my hair parts a certain way. These two shots show parts of one of my scars—the one running from ear to ear. As is mentioned elsewhere on this site, I am anosmic. One doctor claimed that it was caused by scarring left over from my two CS surgeries, while another claimed that it was a congenital condition, completely separate from the CS. Either way, I have never experienced what it is like to have a sense of smell. I am always interested in meeting other adult survivors of craniosynostosis. If you have recovered from it or know somebody who has, please email me! Let’s move on to some links, shall we? Cranio Support, CAPPS, and CranioKids are all wonderful organizations. There are craniosynostosis groups on MySpace and Facebook. A British support group for cranialfacial deformities. Two craniosynostosis e-groups can be found here and here. A comprehensive site on CS can be found here. A small directory of CS sites.